고령상무사는 경북 고령장을 중심으로 하여 인근 상권을 장악했던 조선 보부상단 지부를 일컫는 이름이다. 좌사계(左社契)는 매년 음력 정월에 총회를 열고 임기 1년의 새로운 반수와 접장을 선출한 뒤, 이미 세상을 떠난 역대 반수와 접장 140명의 위패를 모신 가운데 제상을 마련 대제를 지냈다. 선배 보부상의 유덕을 기리며 인근 마을의 안녕을 기원하는 지신밟기 등 농악놀이로 축제를 벌였다. 이 지역은 낙동강 유역과 근접된 곳으로 배편을 이용하여 소금, 생선 등의 물자가 교역되었다. 또한 토질이 자기(磁器) 생산의 최적지로 알려져 물량이 많이 생산되었다. 이들 물품을 조직적으로 유통시킨 집단이 고령상무사다. 반수접장명단(班首接長名單)은 우사상계(右社商契)의 반수(班首)와 접장(接長)을 역임했던 사람들의 명단이다. 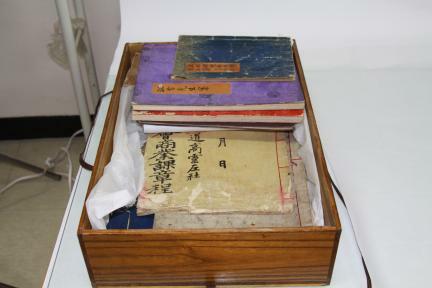 The artifacts were used by peddlers during the Joseon Dynasty. Goryeong Sangmusa refers to the branch of the peddlers’ organization which monopolized market areas around Goryeong in Gyeongsangbuk-do during the Joseon Period. Jwasagye branch held a general meeting in the first month of the lunar calendar every year, elected a new bansu (vice chief) and jeopjang (head) of the branch for a term of one year, and held a grand ritual in front of a ritual table set with 140 mortuary tablets for bansu and jeopjang who had passed away. They held a festival to remember the virtue of elder peddlers and to pray for the peace and prosperity of neighboring villages. The Goryeong area is located near the Nakdonggang River, so the peddlers used vessels to trade salt and fish. The area was the best producer of porcelain in the country due to its quality soil, so Goryeong Sangmusa traded porcelain in the area. Bansu jeopjang myeongdan (List of Bansu and Jeopjang) contains the names of peddlers who served as bansu and jeopjang for the organization.